Design furnitures, olive plants and smoothy vibes are the setting of Molo 47 Restaurant. A cosy and minimal location in La Savina port, Formentera. 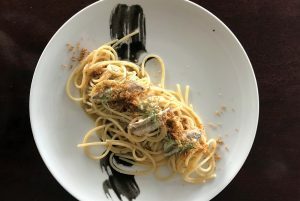 A new style concept on the island born from the will of Chef Antonio D’Angelo in creating a unique place for everyone is looking for 360° high end restaurant. The Neapolitan Chef’s cuisine talks many languages. The strong and typically Japanese attention to details, a miscellaneous but skilful use of both Asian and South American spices and the fundamental Italian culinary tradition revisited with consciousness. It is touring in food markets or standard food stores or even looking at a photo that can give inspiration to the Italian Chef. He loves to put personally lived emotions in his creations. Linearity and simplicity underlie his creations and their presentation. A touch of precious dare produce great tastes and scents, leave the palate always gently intrigued and the belly pleasantly satisfied.